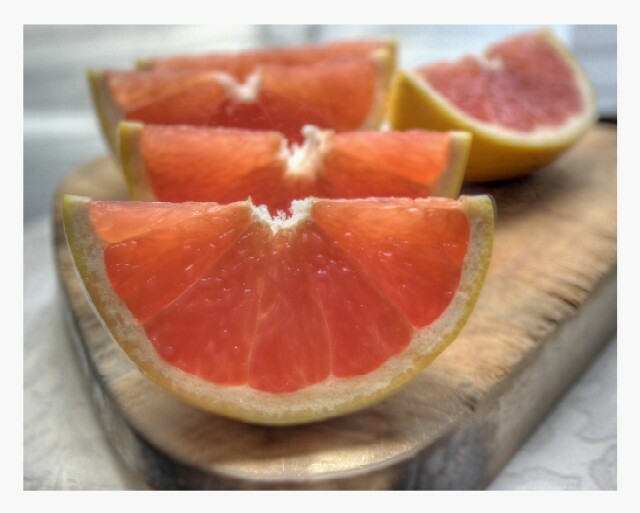 Something that made eating grapefruit fun when I was growing up were the silver grapefruit spoons we were granted permission to use. In the dark hour of morning, with the nimbus of gauzy diningroom curtains just barely aglow before sunrise, I would go into the formal dining room, face the buffet, and pull with all of my weight to get the silver drawer open. The silver drawer was a sacred kind of drawer. It seemed there were movable panels and secret compartments. In one place where you had to lift up a cover, was a stack of velvety thick cards with my full name engraved on them. The silver drawer had a special pretty smell. The wood was old and dry, and the felt lined grooves to stack each implement were the perfect size. The grapefruit spoons were off to the right, they were after the coffee spoons and they had a pointed tip. They made eating a grapefruit a breezy gentle affair, kind of like spooning sherbet from a natural bowl. When I was a kid, I hated eating grapefruit any other way. At some point we obtained a set of less formal grapefruit spoons, with bamboo handles and serrated edges. I think the idea was that they were less dangerous than the pointy silver ones, and their home was in the regular kitchen drawer. I adopted them readily enough but I don't really have special memories of using them except of when we needed a spoon and the only ones left in my 5 kid household were the grapefruit spoons. Scraping ice cream from the bottom of a bowl with a serrated grapefruit spoon is an exercise in futility. You might as well just lick the bowl. I enjoyed using the silver ones to eat the fruit mainly because I was attracted to the silver drawer, and the ceremony of using the precious spoons. I remember the white pithy stuff being almost impossible to remove from the meat of the fruit when I was growing up. I think the fruit has changed somehow.